The Los Angeles County Museum of Art (LACMA) set up pop-up exhibits in just five communities in 2013 and Monterey Park was one of them. Which can only mean one thing: this is the place where downtown LA goes to find a certain degree of sophistication in art appreciation. Monterey Park has long benefited from its strong Asian and Pacific Islander residents, who are a strong engine of business, residential development and some highly rated elementary schools (the community splits between Montebello and San Gabriel unified school districts). But it’s also a community of special attractions, including the Rolex Monterey Motorsports Reunion, the Performing and Fine Arts Center at East Los Angeles College, the Garvey Ranch Observatory and a cacophony of restaurants – many but not all featuring Asian and Asian-fusion cuisine. The typical stucco-clad home in Monterey Park might come in one- and two-story versions. But a steady stream of new-builds since the 1990s blend easily with older structures from early parts of the 20th century. Detached home sale prices have climbed considerably since the trough of the recession in 2009-2011, with a median price (2013) of $478,000; condominiums are at $427,000. While impressive, large homes with commanding views are priced at $2.5 million, 2 bedroom/2 bath condos might sell for $300,000. This is an educated community – more than 28% of residents hold a bachelor’s degree or higher – even while 54% of residents are foreign born, about double the rate of California overall. These skilled workers commute to jobs throughout the greater Los Angeles area by way of the I-170, the San Bernardino Freeway (I-10) and the Pomona Freeway (SR-60). It also has a Metrolink feeder bus. Monterey Park is clearly a distinct community offering several strong opportunities for buying and living. Contact Steve Aranda at 360 Real Estate Group. 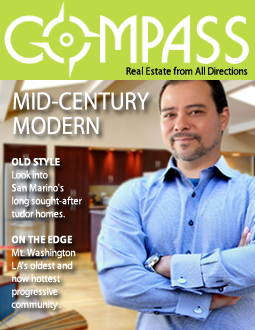 He has represented buyers and sellers in Monterey Park for the past 13 years. Get Our Deal of the Month!